I have waited ten years to see Stephen Harper humbled. I thought it would take a full-blown caucus revolt or a leadership convention defeat, or a massive loss in the next federal election. It only took an act of nature. While his head was firmly stuck in the tar sands, all of Mr. Harper's climate change chickens came home to roost in the capital of his oil industry on June 20, 2013. When he arrived in Calgary on June 21, the flood devastation was at its peak. There was no controlled media studio with seamlessly edited images of kittens and blue sweaters. 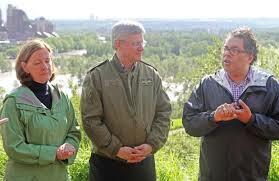 This was all too real with a sombre Harper overlooking the Bow River flanked by some real leaders. 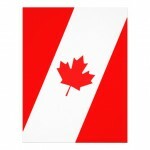 The Mayor of Calgary was resolute, the Premier of Alberta was decisive, the Prime Minster of Canada was simply stunned. “I never imagined we could have a flood of this magnitude in this country. Until you really see it in person you don’t get a sense…this is an incredible event,” Harper said. No imagination. This is the same man who proclaimed that climate change was a socialist plot. 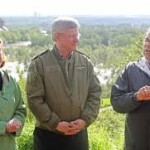 Aided by his "Friends of Science" climate change deniers like Tim Ball and Ross McKitrick and all the other signatories on the anti-Kyoto petition delivered to the newly installed PM in 2006, Harper has systematically destroyed Canada's credibility. He has denied accelerating climate change exists, has removed Canada from the Kyoto Protocol obligations, has snubbed existing environmental review policies, and has impeded the development of new ones. 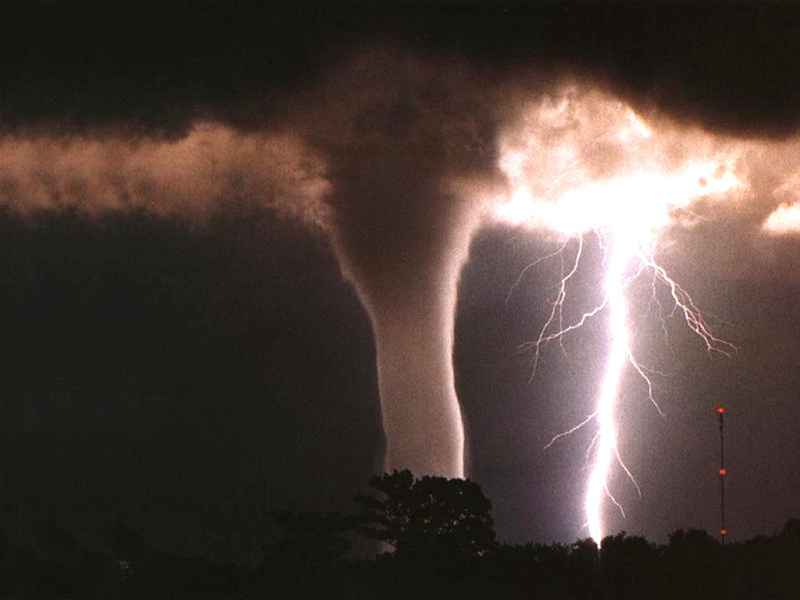 All the while, legitimate meteorologists and scientists have been warning about the increasing frequency of severe storms as one of the symptoms of accelerating climate change. The insurance industry has also been vocal, serving notice that claims for severe storm damage have been steadily increasing in frequency and dollar amount. Unfortunately for Calgarians, Canada is the only G8 country that does not offer overland flood insurance. Critics of this lack of foresight have suggested that we adopt the UK model that links insurance policy coverage to the government's policies to mitigate severe climate change catastrophes. No government policy, no insurance coverage. And those policies would include severe storm disaster preparation. Part of my heart and soul are in Alberta. I met my first grizzly in Waterton Lakes while horseback riding on the trails, and later rock climbing there marvelled at a golden eagle as it soared beneath me. I delivered my first major Global Perspectives keynote on Earth Day 1990 in Kananaskis Country to a lengthy standing ovation. I got married in 1999 in Canmore on the banks of Cougar Creek under the peaks of The Three Sisters and our wedding party walked through town along the Creek's new boardwalk. On June 20, 2013 that was all washed away. My entire wedding party lives and works in Calgary. I emailed them all as soon as we got news of the flood. Their homes were safe and the cabin in Canmore was on high ground and protected. They are also practitioners in wilderness crisis management, and their response didn't mince words: "We are fine, but the city is crippled. This is serious – there's a wide world of hurt ripping away so close to us." 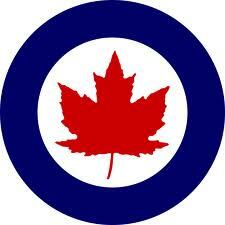 Calgary and Alberta, my heart is with you. Stephen Harper, this is supposed to be your home – wake up! I accidently stumbled upon a website the other day that reminded me how dangerous the Internet can be for web surfers, especially students, searching for legitimate information. A simple search for a weather report landed me in the site of not just a climate change skeptic, but a climate change contrarian/denier. A skeptic is one who doubts the validity of a scientific theory until proven otherwise – a necessary debate in science. But a contrarian/denier is one who dismisses the scientific validity of a theory despite overwhelming data, research, reports and scientific consensus. The term "denier" when applied to climate change was initially hotly debated by ethnic communities who claimed it was both usurping and denigrating the concept of World War II Jewish holocaust deniers. However, the terms holocaust and denier have legitimate and necessary meaning beyond the horrors of the last world war holocausts. Further, those terms are not owned by or copyrighted to Judaic history. but can also be extended to mean any massive slaughter of people. A holocaust denier is one who says the destruction/loss of life never happened. A climate change denier is one who says accelerating climate change due to anthropogenic causes is not happening. Both ways of thinking are equally condemnable. When 95% of the practicing, published and peer-reviewed climate change scientists globally agree that a) climate change is a natural cyclical process, and b) we are living in a period of accelerating climate change due to anthropogenic causes, then anyone who disagrees with that consensus is not a skeptic, but a contrarian/denier. The accelerated change is a human caused economic decision, and the predicted collapse of species populations, including human, will result in a holocaust unparalleled in human history. The violence in the Middle East will pale in comparison with the global upheaval caused by the collapse of even one of Earth's ecological systems. You don't have to be a rocket scientist to predict what will happen when 7 billion people start scrambling for food and shelter on the remaining habitable spaces. The Earth is clearly saying, "You can pay me now, or you can pay me later." Deny this and we all pay. My youngest son was planning our July canoe trip and we wanted to get a "reliable" long range forecast. So, with complete trust, I searched for my favourite weather report by typing in "Environment Canada long range weather forecast". To avoid the Google fiasco, I had just started using DuckDuckGo as my search engine, and up popped a site titled, "Weather in Canada Observer" with the explanatory subtitle: "The long range weather forecast issued by Environment Canada is vital to the economy." A Raging Debate! 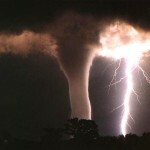 There is strong disagreement on the real causes of global warming!" Having been immersed in synthesizing climate change data for the last 35 years, all my warning flags went up. Turns out, this in NOT an Environment Canada (EC) website although it makes enough references to EC, cleverly stating in bold print that the "official version" of the weather forecast is produced by EC. This is a private site, run by moderator Claude Jollet, an entrepeneur who claims to be a former planning advisor to major industrial and commercial clients, specializing in weather related operational planning issues. He currently promotes web-based publishing. He claims to hold a B.Sc. specializing in business process analysis and automation. On his LinkedIn page, he also claims to have received his education from the Environment Canada School of Meteorology from 1966-1974 (there is no Environment Canada School of Meteorology) when he was actually working for the Ministry of Transport. So just how good is the weather science on this site? There is no doubt that Mr. Jollet has a passion for weather, affectionately referring to himself as "the weather guy", and is obviously having a lot of fun in his retirement posting his blogs. However, his claims that he worked with Environment Canada for somewhere between 15 or 17 or 31 years (depending on which part of his site you research) – are simply not true. Mr. Jollet did, to his credit, take meteorlogical courses while working with the Ministry of Transport back in the '60's and '70's, and did take two courses through Environment Canada in the '80's, but, alas, Mr. Jollet is neither a meteorologist nor a climate change scientist. The science does not pass the sniff test of the 3 P's – practicing, published, and peer-reviewed. Mr. Jollet and I have since exchanged emails and he was courteous enough to publish my short rebuttal about climate change deniers, accompanied, of course, by his lengthy editorial essay defending his right to publish his opinion. Garbage in, garbage out as the saying goes. Claude certainly does not appear to get his information from NASA, NOAA, the MET Centres in Hadley and Bern, nor the IPCC where over 95% of practicing, published, peer-reviewed scientists actually agree on the real causes of climate change – an acceleration of natural climate change processes caused by th e net effect of human activities. Rrather "the Observer" seems to get its science details from sources like the much discredited magazine New Scientist, a non-peer reviewed journal of science related ideas and opinions. You are what you eat; ten mililon flies can't be wrong. 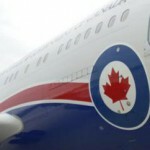 I was challenged by an enraged local tory over my last post mocking the Conservative paint job on "Canada's Economic Action Plane"; he declared that there was nothing wrong with "Tory Blue" being added to "Liberal red and white" colours. Well, au contraire mon ami! It is very wrong simply because the official colours of Canada are only red and white, no blue of any kind – not royal, azure, ocean, or tory. The official colours of red and white were proclaimed by King George V in 1921, red from the French and white from the British in a cultural reference to the crusader's crosses of those European founding countries. 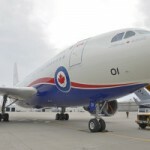 So, if the PM's plane is painted with the official colours of red and white, then it is Canadian; if it is painted with the official colours of the Conservative Party, then it is a flying election bus for Stephen Harper, and someone in the PMO should cut another slush fund cheque to pay back the taxpayers. 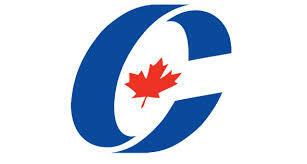 Yes, Canada, it is true – we now have a flying billboard for the Canadian Conservative Reform Alliance Party. 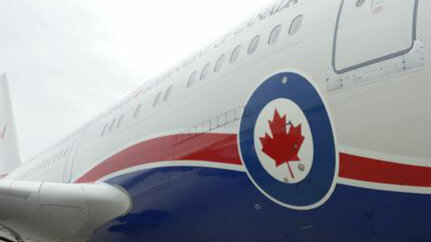 First we have the honourable – the logo, all royal blue circling a fully etched maple leaf, of the Royal Canadian Air Force for which my father flew in World War II. The "Royal" was lost for a while during the Canadian Armed Forces amalgamation, but was reinstated in 2011, along with a simplified maple leaf. 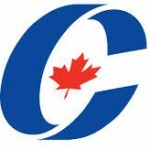 and symbols (the "C" that never ends, the simplified maple leaf) of the Conservative Party of Canada, a symbol that was supposed to represent accountability and transparency, now more closely associated with micromanaging scandals and remaking Canada in the image of an oil corporation. advertisement for the Conservative's Economic Action Plan; if you look closely, you'll notice the logo is NOT the RCAF's original but is the Conservative modification. 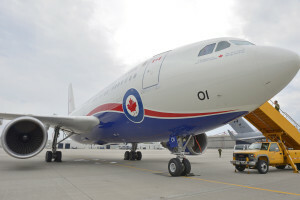 Behold the Canadian PM's freshly painted plane, all battle ready for our military to borrow for use in the world's most dangerous regions. Nice target for any opposition.